Camino de Santiago de Compostela: On Your Way! The Camino de Santiago de Compostela, also known by the English names Way of St. James, St. James’ Way, St. James’ Path, St. James’ Trail, Route of Santiago de Compostela and Road to Santiago is the name of any of the pilgrimage routes to the shrine of the apostle St. James the Great in the Cathedral of Santiago de Compostela in Galicia in northwestern Spain, where tradition has it that the remains of the saint are buried. Many take up this route as a form of spiritual path or retreat for their spiritual growth. The Way can take one of dozens of pilgrimage routes to Santiago de Compostela. Traditionally, as with most pilgrimages, the Camino de Santiago de Compostela began at one’s home and ended at the pilgrimage site. However a few of the routes are considered main ones. Let’s take a closer look at them in the next section. The French Way is the most popular of the routes. It runs from Saint-Jean-Pied-de-Port on the French side of the Pyrenees to Roncesvalles on the Spanish side before making its way to Santiago de Compostela through the major cities of Pamplona, Logroño, Burgos and León. The Camino de Invierno is an alternative for the last stages of the Camino Francés. The advantages are that it bypasses the heights (and snow in winter time, hence the name) of O Cebreiro and the crowding of hundreds of pilgrims starting at Sarria. Approximately 210 km from Ponferrada through Monforte de Lemos and A Laxa and Lalín, this alternative joins the Via de La Plata / Camino Sanabrés, to Santiago. The origin of the pilgrimage to Finisterre is not certain. However, it is believed to date from pre-Christian times and was possibly associated with Finisterre’s status as the “edge of the world”. The tradition continued in medieval times, when “hospitals” were established to cater to pilgrims along the route from Santiago de Compostela to Finisterre (89 km). The Camino Finisterre ends in Cape Finisterre and is the final destination for many pilgrims on the Way of St. James. Cape Finisterre is about a 90-km walk from Santiago de Compostela. It is a recent tradition for pilgrims to burn their clothes or boots at the end of their journey at Cape Finisterre. Some pilgrims continue on to Muxia, which is an additional 29 km. There is also the option to first walk to Muxía (87 km) and then continue on to Finisterre. The Portuguese Way begins at Lisbon or Porto in Portugal. From Porto, pilgrims travel north crossing the Lima and Minho rivers before entering Spain and then passing through Padron before arriving at Santiago. It is the second most popular way, after the French one. The route is 610 km long starting in Lisbon or 227 km long starting in Porto. There are two traditional routes from Porto, one inland (the Central Way) and the Coastal Way (Caminho da Costa). 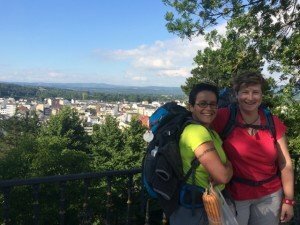 This was our first camino, long before we had plans of starting Camino Comfort! Luisa’s paternal roots have their origin in Baiona, a small fishermen’s village in the South of Galicia, often chosen by pilgrims who want to travel the last 100K of the Camino Portugues via the Coastal route. We can 100% recommend it. Although there are not a lot of albergues on the coastal part, you will not have any trouble in finding a place to sleep since the whole coast area is set up for the local tourists. A food heaven for pilgrims, and resting on the beach after a day’s walk is priceless! The Camino winds its way inland until it reaches the Spanish border through Valença, which is also a popular starting point for a 108 km walk to Santiago on the Central Way, passing through Tui, Galicia. The Coastal Way gained importance since the 15th century due to the growing importance of the coastal towns. The route splits from the central way in the countryside of Vila do Conde and enters the town through the Monastery of Santa Clara and the Matriz Church of Vila do Conde was built by king Manuel I of Portugal while in pilgrimage. The rising importance of Póvoa de Varzim imposed this new direction, which also crosses Esposende, Viana do Castelo and Caminha before reaching the Spanish border. The Northern Way runs from France at Irún and follows the northern coastline of Spain to Galicia where it heads inland towards Santiago joining the Camino Francés at Arzúa. This route follows the old Roman road, the Via Agrippa, for some of its way and is part of the Coastal Route – Ruta de la Costa. The route passes through San Sebastian, Gernika, Bilbao, and Oviedo. It is less populated, lesser known and generally more difficult hiking. Shelters are 20 to 35 kilometers apart, rather than there being hostels or monasteries every four to ten kilometers as on the Camino Francés. On the Northern Way, arriving at a small village of Casquita there is an option to continue on the Northern Way to Gijón, or to continue the journey on The Primitivo Way, to Oviedo. El Camino Primitivo will lead you through the inlands of Asturias and Galicia via the gorgeous city of Lugo. It continues its way to the South, joining the French Way in Melide. The English Way is traditionally for pilgrims who traveled to Spain by sea and disembarked in Ferrol or A Coruña. These pilgrims then made their way to Santiago overland. It is so called because most of these pilgrims were English though some come from all points in northern Europe. The Via de la Plata is sometimes incorrectly known in English as the Silver Route or Way – “Plata” is a corruption of the Arabic word BaLaTa, meaning paved road. The Via de La Plata (once a Roman causeway starting in Emérita Augusta (Mérida) and ending in Asturica Augusta (Astorga) starts in Seville from where it goes north to Zamora via Zafra, Cáceres and Salamanca. It is much less frequented than the French Way or even the Northern Way. After Zamora there are three options. The first route, or Camino Sanabrés heads west and reaches Santiago via Ourense. It totally deserves its own chapter, so read on about this itinerary in the next paragraph! Wiki is not complete on this one, but Eroski resource always is! Another route (original Via de la Plata) continues north to Astorga, from where pilgrims can continue west along the Camino Francés to Santiago. A third, seldom traveled route, crosses into Portugal and passes through Bragança, rejoining the Camino Sanabrés near Ourense. The Camino Mozárabe route from Granada or Malaga, passes through Córdoba and later joins up with the Via de La Plata at Mérida. The Camino Sanabrés is the 368km route that officially starts in Granja de Moreruela and passes through Ourense. For pilgrims that want to do the last 100K of this camino, Ourense is a great starting point! These other routes are less known to most people. Although we chose to not provide additional information on these ones, the Eroski site does and has a wonderful map (see below) that shows you exactly where the routes are (if you click on the map you will be directed to their site, where the map is interactive). Great resource! The Aragonese Way comes down from the Somport pass in the Pyrenees and makes its way down through the old kingdom of Aragon. It follows the River Aragón passing through towns such as Jaca. It then crosses into the province of Navarre to Puente La Reina where it joins the Camino Francés. The Tunnel Way is also known as the Tunnel Route, the Basque Inland Route and the San Adrian Route. In the Early Middle Ages, when the Northern (Coastal) Way was subject to the Vikings’ skirmishes and Muslim presence and forays threatened pilgrims and trade routes in the borderlands, the Tunnel Way provided a safe road north of the frontier area, i.e. Gipuzkoa and Alava. This may be the oldest and most important stretch of the Way of St. James up to its heyday in the 13th century. From the starting point in Irún, the road heads south-west up the Oria valley (Villabona, Ordizia, Zegama), reaches its highest point at the San Adrian tunnel and runs through the Alavan plains (Zalduondo, Salvatierra/Agurain, Vitoria-Gasteiz and Miranda de Ebro). Yet previous to the latter, nowadays pilgrims usually take a detour south towards Haro and on to Santo Domingo de la Calzada on account of its better provision. The Camino Catalán starts in Montserrat and continues to Santa Cilia de Jaca, where it joins the Camino Francés as it enters Spain via Somport. The Camino Baztanés starts in Bayona where the initial part is a joined route with pilgrims that will continue on one of the three routes that pass through Bayona. This one guides you through Ustaritz, Urdax, Elizondo, Berroeta, Olague and continues to Pamplona, where it joins the French Way. This one starts in León (birthplace of the father of Luisa) and passing through La Robla, Poladura de la Tercia, Pajares, and Pola de Lena, you will arrive in Oviedo – where you can opt to continue to Santiago via The Primitive Way. The Camino de Madrid goes northwards from Madrid, through Segovia and Valladolid, joining the Camino Francés at Sahagún. The Camino del Ebro starts in Catalonia at Sant Jaume d’Enveja near Deltebre, where Saint James is traditionally supposed to have left Spain on his way home to martyrdom in Palestine, and follows the River Ebro past Tortosa and Zaragoza, joining the Camino Francés at Logroño. Sometimes known as the Camino Castellano-Aragonés, this camino leaves the Camino del Ebro at Gallur and goes past Soria to Santo Domingo de Silos, where it joins the Camino de la Lana. The Camino de la Lana (sometimes Ruta de la Lana), or wool road, leaves Alicante and heads mainly northwards for 670km, joining the Camino Francés at Burgos. The Camino de Levante starts at Valencia and crosses Castille-La Mancha, passing through towns and cities including Toledo, El Toboso, Ávila and Medina del Campo, joining the Via de la Plata at Zamora. The Camino del Sureste starts at Alicante and follows a broadly similar route as the Camino del Levante from Almansa until Medina del Campo, where the routes bifurcate, with the Sureste heading northwards to Tordesillas, joining the Via de la Plata at Benavente, while the Levante goes westwards to Toro and Zamora. On these pages you will be able to check-out the main routes of the Camino de Santiago de Compostela, view some maps and get started in choosing your Way! The information provided on these pages pertains from several internet resources, the most common being Wikipedia for some of the more general information, like some of the short descriptions of the pilgrim routes on this page. 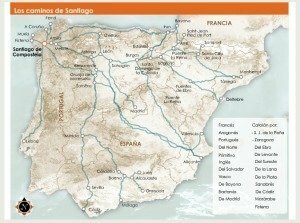 If you link through to our individual camino pages, you will find some links to a great resource we found that is unfortunately only available in Spanish: http://caminodesantiago.consumer.es/, from the Eroski foundation. If you are walking and in need of a good supermarket (supermercado) you will find often an Eroski supermercado. You only need to look at their site to see that they are true pilgrim friends. Thankfully, the Eroski foundation gave their approval to link to their page. At camino comfort we will be using their resources to link to, providing English explanations of their content where needed. 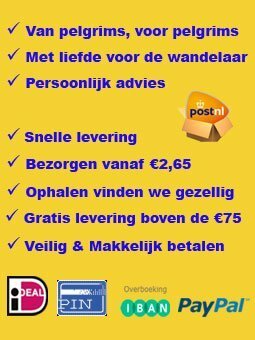 Their site contains up-to-date maps, itineraries, altitude maps, descriptions of monuments, lists of albergues and much much more. At camino comfort we will make an effort of translating some of their information because we found it to be an amazing resource. It helps us to plan all of our caminos and it helps us research questions from other pilgrims who are in need of answers. Eroski, GRACIAS! Follow them on their Twitter account: pictures speak more than (Spanish) words and they are awesome! On each Camino page you will find an interactive Google map. These maps were shared by www.elcaminosantiago.com and we added here and there some way points to match it better with the stages of Eroski’s itinerary. We have found those maps to be incredibly helpful. Google maps are publicly shared to be able to display them so we assume it is okay to re-share them here. Via this way, we would like to thank the creator of that website for sharing this valuable information and to contact us if there is any inconvenience in us displaying the maps. Kudos to the owner of elcaminosantiago.com, whoever it is, it must be a true pilgrim!